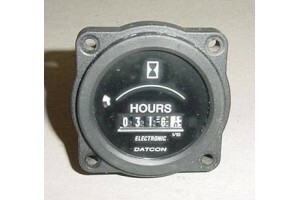 Cessna Piper Beech Datcon Hobbs / Hours Meter. P/N 100690. Cessna Piper Beech Datcon Hobbs / Hours Meter. P/N 100690. Model 873-1B. Exceptionally clean instrument. Removed from salvage aircraft. It operates on both 12V and 24V. It reads 316.1 hrs.